The Laerdal Suction Unit LSU with Reusable Canister helps save lives on a daily basis around the world. Part of the unit's appeal is its reusable canister. 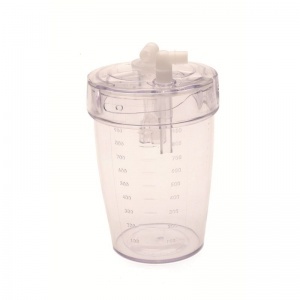 The Replacement Canister for the Laerdal Suction Unit with Reusable Canister can either be used as a spare or additional part depending on whether you require a second container or need to replace your initial one. Simple to attach and ready for immediate use, the canister allows the unit to be used multiple times in quick succession (if required). The canister is quick and easy to attach, while its clear shell with measurement markings makes it straightforward to monitor the current situation. Owing to its design, you can easily see when the canister needs to be emptied. The Replacement Canister for the Laerdal Suction Unit with Reusable Canister will be subject to a delivery time of 3 - 4 working days after the point of order. For more information, contact our Customer Care Team at 020 7501 0593.